Not only a victory but a full triumph. Such an achievement I couldn’t even imagine in my dreams…..
Tough opponents couldn’t stop my run to my personal records: 6 games and 2,735 General Average. Nobody did it better with so many games I guess. I played my best Tournament ever at the right moment and at the right place, I feel so grateful! Should I maybe put my head in the ice cold water to get awake? Or just recognise that I’m still improving technically and mentally? I dedicate this LG title first to all my family, with a special grateful thanks to my Dad Erwin, 30 years ago he passed away (exactly on Sep. but we still are strongly connected. To my mom, now 94 and even more friendly and smiling everyday more. To “my own” family, the unbelievably patient Martina and the sunny boy Samuel. 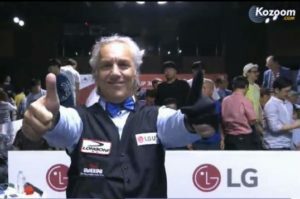 Finally to my “large family” of billiard friends, supporters and fans, close and far, who are supporting and encouraging me and also suffering with me. You all really enrich my life immensely. In this special moment too much people would deserve a thank from my side, so let me just share with you all this deep and delicate joy. I feel proud of my roots and I consider myself lucky because billiards helped me to have many friends and also great relationships, including those with some of my sponsors.